My family typically makes this recipe during the high holy days. We call them Cheese Sambusuks. 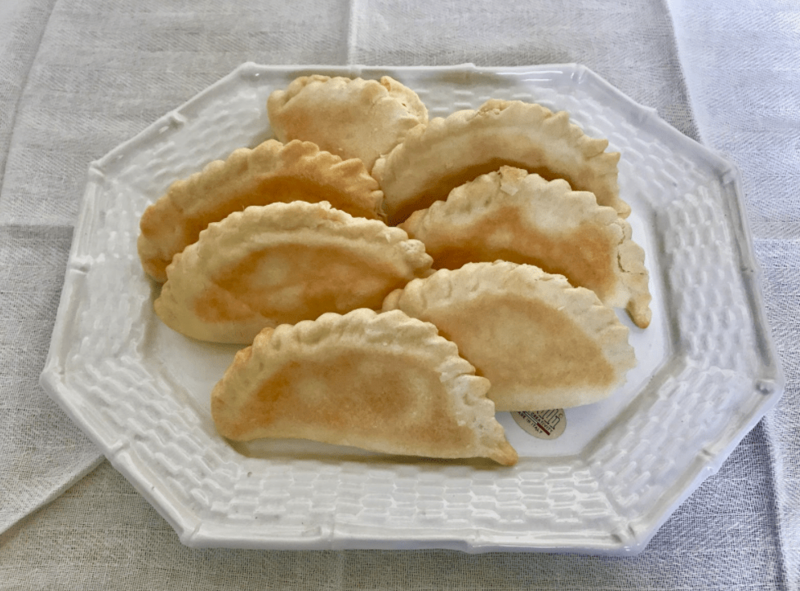 Cheese Sambusuks are an Indian-Jewish recipe that has been used throughout the years. My grandparents and my mom were born in Calcutta, India. Cheese Sambusuks are great with tea and coffee. My family would serve it with high tea. In Calcutta, we would make these at home and most kids and adults enjoyed them. Traditionally, we would break the Yom Kippur fast with a few Cheese Sambusuks to hold us over until we could have our real meal. We would pack Cheese Sambusuks right before we left for synagogue. I have many memories as a child looking forward to breaking the fast right after the Yom Kippur service. The Nahoums and Sons Bakery is one of the last Jewish bakeries in India. The bakery was founded in 1902 by a Baghdadi Jew, Nahoum Israel Mordecai and is over 100 years old, located in the new market. Ironically, they are famous for their Christmas fruitcakes. Many people go there to experience the wonderful taste of Indian and Jewish delicacies. First, mix the dry ingredients — the flour, salt, sugar and baking powder — together. Add the margarine or butter by rubbing or cutting it into the flour. Add enough of the water to prepare a moist, but firm dough. Knead the dough for a minute for smoothness, then wrap the dough in foil and refrigerate for an hour or more. While the dough is chilling in the refrigerator, grate the cheese in a processor and add the eggs and black pepper. Mix to a smooth consistency. 3 ½ to 4 inch circles. Put 1 heaping teaspoon of the cheese mixture into the center of each circle. Moisten the lower edge of the dough with a your finger and fold the pastry in half and press the edges together firmly. Heat the oven to 400˚F. Bake for 30 to 40 minutes. Remove and cool. *They are best served warm but may be served at room temperature. These can also be made with almond filling. Grind the almonds coarse in a processor. Mix it with the sugar and rosewater. Prepare the pastry the same way as the cheese puffs and fill with the almond mixture. Bake at 375˚ F for 15-20 minutes, or until pastry is light brown.